I’m pleased to welcome British illustrator Neal Layton to 7-Imp today. As many of you know, lots of blogs in the kidlitosphere like to celebrate nonfiction on Mondays. 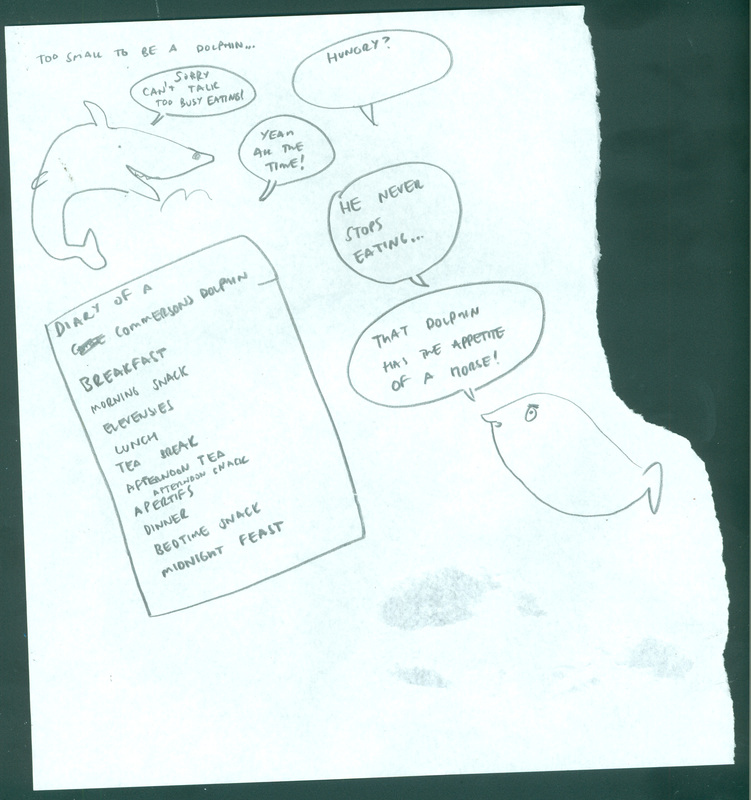 Now, Neal has written and illustrated some pretty wonderful fiction titles. I love his illustrations for the wonderful That Rabbit Belongs to Emily Brown by Cressida Cowell (Hyperion, 2007). (Evidently, there is a new Emily Brown sequel in the U.K. Excellent. Guess I’ll have to wait a while for that one.) Oh, and have you read the Mammoth Academy chapter books (published by Henry Holt)? I’ve only read the second, which was released this summer, but it had me and my kindergartener laughing out loud. But I’m here today to highlight what happens when Neal pairs up with author Nicola Davies. 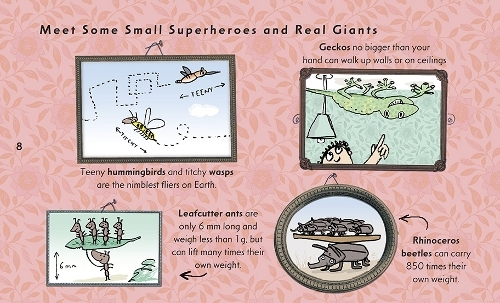 What happens, to be exact, is that they create excellent nonfiction titles for children. Neal’s here to say a few words about them and his work. Neal and Nicola have done, thus far, four titles together — all about animals (and all released by Candlewick). 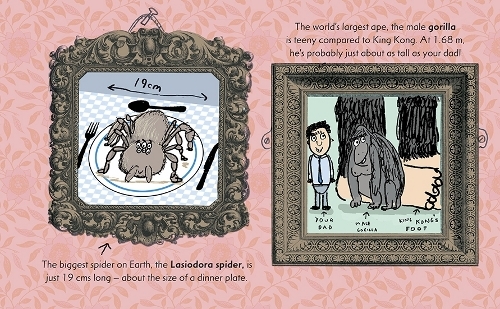 The latest, Just the Right Size: Why Big Animals Are Big and Little Animals Are Little, was released this summer. And it all began with Poop: A Natural History of the Unmentionable (or Poo, if you live in the U.K., as Neal notes below), followed by Extreme Animals: The Toughest Creatures on Earth (which I posted about here in ’06, that era In Which All of 7-Imp’s Images Were Tragically Small) and What’s Eating You? : Parasites — The Inside Story. Nicola, who has a degree in Zoology and has also worked as a researcher, writes in a very accessible manner — with humor and style. Who else could make us want to read about poo? (I’m going with “poo,” the British version; the American one is a bit too much before breakfast.) And the spontaneity in Neal’s work is refreshing. He knows to embrace his Inner Scribbler and Doodler. Here he is to say a few words, as well as give us a glimpse into his sketchbook, and I thank him for stopping by. 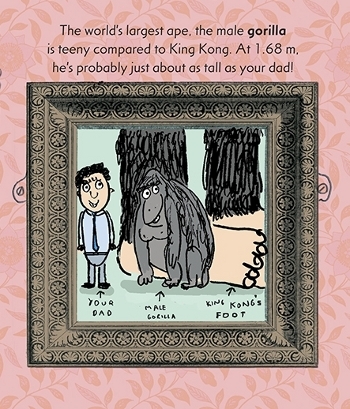 Just the Right Size: Why Big Animals are Big and Little Animals are Little is the fourth book in a series that began with Poo! : The Natural History of the Unmentionable. The designer, Ben Norland, chose me for the book, because he had enjoyed the playful doodle-like feel of limited-edition sketchbooks that I used to self-publish and distribute to friends and colleagues. He thought this kind of approach would work well with Nicola Davies’ informative and witty style of writing. 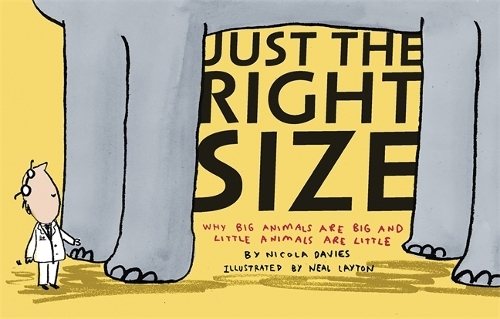 Just the Right Size is all about how animals get to be different sizes, and some of the book tackles quite complicated maths in a simple way, so I had to find ways to describe things like weight and volume, whilst retaining the books light sketch-book-like feel. One of my solutions was to use lots of different graph papers — I think I used about five or six different types in the end! The books evolve as a team effort with me working closely with the author, Nicola Davies, and the designer, Ben Norland. The process starts with an initial meeting with Nicola and Ben, where we talk through the book from start to finish, throwing ideas back and forth, sort of jamming with the ideas. I’ll end up with lots of sketches from this, which can sometimes become finished art work for the book. It’s really useful to have Nicola here at this early stage, as she has a vast knowledge of her subject and can advise on details that would be hard to research. It’s not uncommon for her to leap up from the table and start demonstrating how a particular monkey might walk or squawk, for example! With my loose style of illustration, the design is also crucial, so Ben and I will have lots of to-ing and fro-ing, as the book progresses, so that the design and illustrations develop together. At the moment, we are working on a fifth book in the series, all about how animals communicate, so—amongst other things—I am drawing beavers communicating with smell inside the pitch black inside of a beaver lodge, using big heaps of real sticks for collage. Working on these books is fun — but also quite challenging! Today’s Nonfiction Monday round-up, if you want to read about some other nonfiction titles this morning, is being hosted by the wonderful Diane Chen at Practically Paradise. Sketchbook image used with permission of Neal Layton. JUST THE RIGHT SIZE. Text copyright © 2009 by Nicola Davies. Illustrations copyright © 2009 by Neal Layton. Reproduced by permission of the publisher, Candlewick Press on behalf of Walker Books, London. 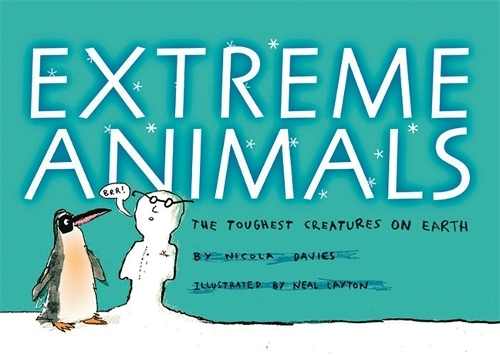 EXTREME ANIMALS. Text copyright © 2006 by Nicola Davies. Illustrations copyright © 2006 by Neal Layton. Reproduced by permission of the publisher, Candlewick Press on behalf of Walker Books, London. 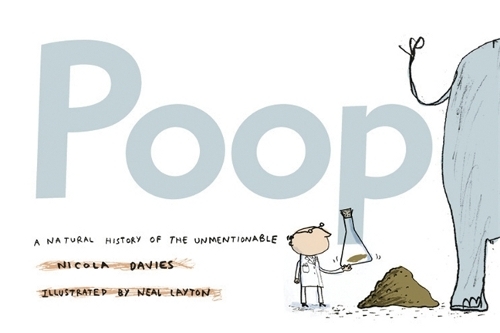 POOP: A NATURAL HISTORY OF THE UNMENTIONABLE. Text copyright © 2004 by Nicola Davies. Illustrations copyright © 2004 by Neal Layton. Reproduced by permission of the publisher, Candlewick Press on behalf of Walker Books, London. 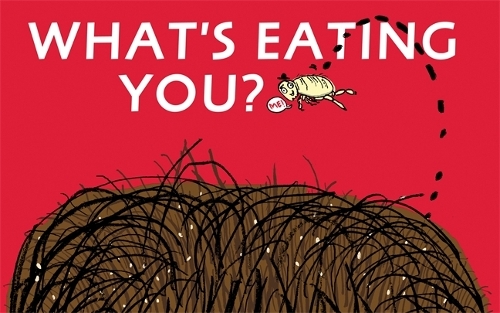 WHAT’S EATING YOU? Text copyright © 2007 by Nicola Davies. Illustrations copyright © 2007 by Neal Layton. Reproduced by permission of the publisher, Candlewick Press on behalf of Walker Books, London. HA! That last title might be one of the best ever. Love the sense of humor he’s bringing to science…it’s great when kids are learning, but don’t realize it.